Our research focuses on understanding the neural circuitry that controls arousal and sleep, and how the function of this circuitry is disrupted in narcolepsy and other sleep disorders. A major line of investigation is to determine how this circuitry is disrupted in narcolepsy and how it can be corrected. A small cluster of neurons in the lateral hypothalamus produces the orexin (hypocretin) neuropeptides, and we found that these neurons are especially active during wakefulness. We and others found that narcolepsy in humans is caused by a loss of the orexin-producing neurons, and loss of orexin signaling in mice and other species produces the major symptoms of narcolepsy, including severe sleepiness and sudden episodes of muscle paralysis known as cataplexy. Current projects focus on understanding how orexin deficiency causes sleepiness, how strong emotions trigger cataplexy, and how various therapies can improve these symptoms. 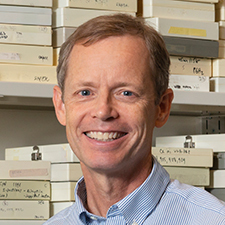 Other projects in the lab focus on defining other arousal-promoting circuits; the interactions of thermoregulation and sleep; the neuropathology of sleep/wake circuits in people with narcolepsy; how traumatic brain injury causes chronic sleepiness; and the interactions of sleep and pain. We use a variety of methods to study the circuits that control sleep and arousal, including physiological techniques such as optogenetics, chemogenetics, and sleep recordings in combination with viral vectors in various lines of recombinant mice to manipulate specific neuronal populations. In addition, we map neuronal pathways using immunostaining, in situ hybridization, and microinjections of traditional tracers and conditional tracers such as rabies.